When we moved in the hallway was painted magnolia and the woodwork ivory. 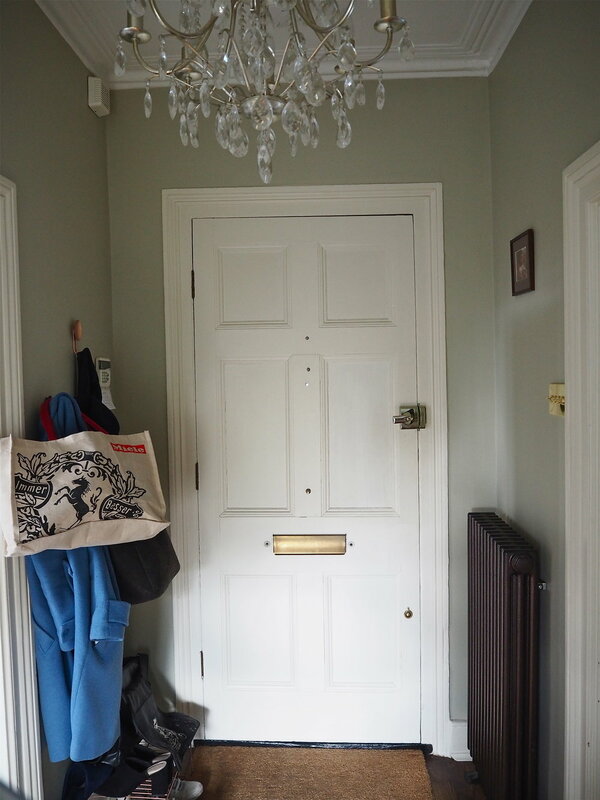 To try and give the hall a bit of depth I painted it this greeny-grey colour and left the ivory trim as it was. The neutral carpet was innoffensive and in great condition so it stayed. The problem that I have with this space is that the light bursts in and up the hall and I don’t think at the top the colour looks very complimentary in the light. It becomes almost a lime green in places. I also think a big mistake that I made was to leave all the doors and woodwork in ivory - it makes the features very plain, nothing special, and the whole hall has no ‘oomph’ to it. When I walk in my front door the space does not give me joy, it does not reflect my love of colour and pattern and it certainly does not feel modern. As a paint geek, I am always interested in different paint brands, their colours and their ethos. I had recently received a press release in regards to M&L, who had decided to let the previous name of Marston and Langinger slide in favour of using the simple initials. A UK paint manufacturer, I was intrigued by their range so reached out for a colour card. M&L got back in touch and asked if I fancied a collaboration, so I thought it would be the ideal time to address the hallway and think about how I could turn it into something that was much more ‘me’. In all honesty, I didn’t have any clear, initial idea of what would work in this space or make it look better. Hallways can be so hard to design, especially if they span more than one floor. The light can be different on each level and often furniture is not going to be a feature, so the walls need to do the talking. Ideally, I would love to panel the space, but there are so many dips and grooves and curves I wouldn’t be able to achieve any level of symmetry. Instead, I had one key piece of art and some fabric that I wanted to create curtains with, so those became my starting point for the whole scheme. This beautiful print by Max Made Me Do It was gifted to me at the end of last year and I knew I wanted it to be a key feature at the top of stairs. All the art hung in the hallway currently just does not work. 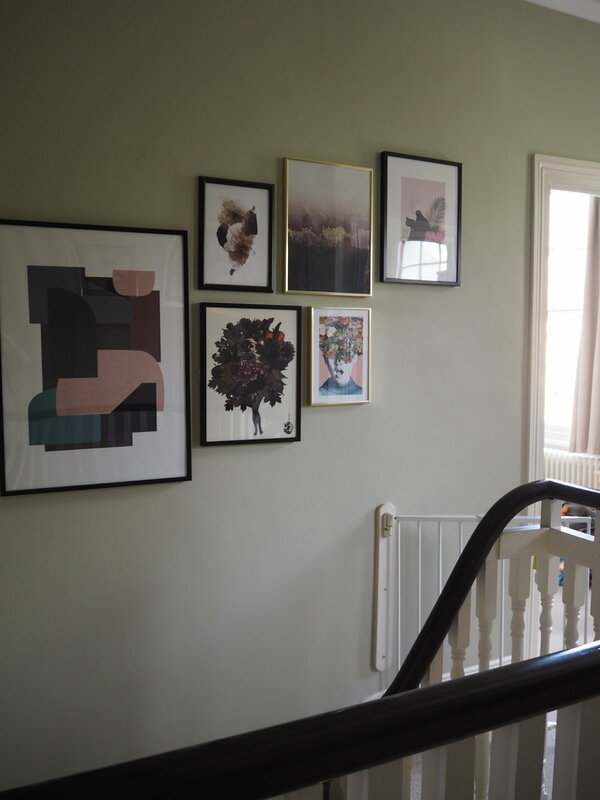 The gallery wall looks lonely, while other art pieces are hung on hooks placed there by the previous owners and thus hung too high for the space. I was an avid collector of vintage floral art in my 20’s and it is all currently stored in the loft as I could not find the right place for it in our new home. This vintage art would look amazing alongside this new floral piece, so I am going to add in some picture rails to give the art a more relaxed look, rather than being displayed directly on the wall. I also had some fabric gifted from Earthed by William Clark in this Wild Grasses print from the Pilgrimage Collection, that was being made into curtains for the top of the stairs. The current curtains in this space were always temporary (as they didn’t even meet the floor), so I had two floral starting points for the decor scheme. It seemed logical that a beautiful, dusky pink would complement the florals, yet I was concerned that pink scaling two floors would feel too sugary. Instead, I thought that a pink on all the woodwork (windows, doors, trim) would give a good contrast to a warm neutral that would bounce around the light in this tricky space and make the whole area feel lighter and brighter (and not lime green). M&L Paints, clockwise from top left: White Lilac, Plaster Pink, Old Rose, Steel, Shell and Hilltop. M&L sent me samples of all their key pink colours and I was instantly drawn to Plaster Pink and Old Rose. Old Rose has a very dusky, vintage feel to it, but I felt that it may be too strong to use in such a large area of my home. Instead, Plaster Pink was the perfect shade: grown up, delicate, but not too candy-coated. M&L Warm Neutrals, L-R: White Pepper, Paperlining, English Plaster. I’ve decided to team it up with English Plaster, a warm, grey-tinged neutral. I also fell in love with White Pepper, which is more of a shadowy white, but I felt it did not give as much contrast to the pink as English Plaster does. Last month I was also lucky enough to be asked to choose a piece of art by Abstract House who sell original art and art prints. I chose this beautiful piece above which I’ve balanced over my fireplace called ‘Untitled #390’ by the artist Alexander Kline. This giant piece of art I am going to hang in place of the awful gallery wall! A gallery wall just isn’t really my style and I couldn’t get one to work on the stairs, so instead I’m having one large art piece to display. What do you think? I’m really excited to get going and hopefully I’ll be back in a few weeks with the full reveal! Want to see the full reveal? Sign up to get the post sent straight into your inbox! Thank you! Please click the confirmation link in your inbox!